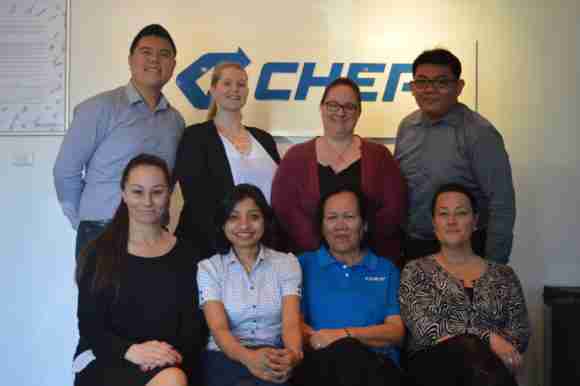 Members of CHEP Australia’s Customer Support Team. Top Row (L-R): Adrian Suseno, Madeleine Honyi, Lisa Fullagar, Erwin Wijaya. CHEP Australia has been recognised as a state finalist for Best Centre Team, announced on 30 August 2017. This award considered results from individual submissions and interviews. Individuals from CHEP Australia were interviewed for roles including; customer contact professional, operations champion, people champion, team leader and team manager. The Best Centre Team category identified organisations which had the best pool of talent across the team based off the individual entrants in each of the individual categories. Fiona Keough, CEO Auscontact Association said, “We are delighted at CHEP Australia’s performance and result of Finalist for Best Centre Team for NSW. “At Auscontact we understand that each person in a team delivers an unique and valued contribution, and a centre that cultivates a broad and deep range of talent is truly creating an exceptional environment of achievement and excellence, and ultimately, a great customer experience. “It was clear from the CHEP Australia team’s performance, each individual nominee operated at a high level of competency, confidence and clarity. It was clear from all nominees that a strong sense of organisational values, role mastery and a customer-centric approach carried them through as Finalists. Companies around Australia have been recognised for outstanding customer service, individual achievements and team work at the 2017 Auscontact Awards. Ms Keough adding, “This year’s Auscontact Awards were in celebration of the individual achiever, with a special Award recognising the organisation who entered the most outstanding team of individuals. “Well done to CHEP Australia for the outstanding individual and team achievement.” Ms Keough said. Angela Wade, Senior Manager Customer Support at CHEP Australia is delighted that the CHEP customer contact centre is considered in the top three best contact centres and is proud of the effort, calibre, and energy her team bring to work every day. “Our team were recognised for things like collaboration, drive, and being high skilled in their fields. When they speak with customers about their supply chain needs they take real ownership in their work and see things through from beginning to end.